I’m gutted for the lads. They were brilliant. I thought we were the better team, really pushing for it and Arsenal were happy to hit us on the counter-attack. I’ve said sorry to the lads. I think I should have just Cruyff-ed him to be honest, but it’s not my style. Daryl played the ball back to me. I wanted to drag it onto my left and then hit it out wide, but before I know it he’s bloody on to me. God, he’s fast. Fair play to him, he’s absolutely rapid. I’ve got to do it a bit quicker, you’ve got to just get rid as soon as you can. It’s not the time to muck about. I’m definitely not a modern goalie. I’m happy to put it in row Z. I just thought I had a bit more time than I did. Troy’s not happy about it in there. Said it was absolutely nothing, didn’t mean to do anything and that’s all I can say. More from Aubameyang. 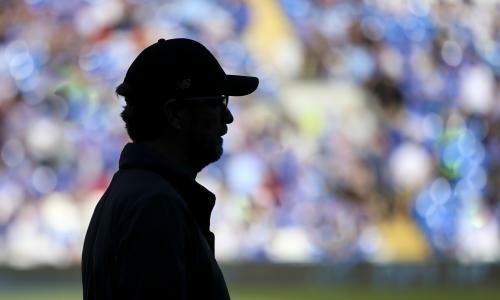 The result will be pleasing, for sure, but I don’t think there’s any reason to take confidence from their performance. These three points give us a lot of confidence, because now we know we can win games away. 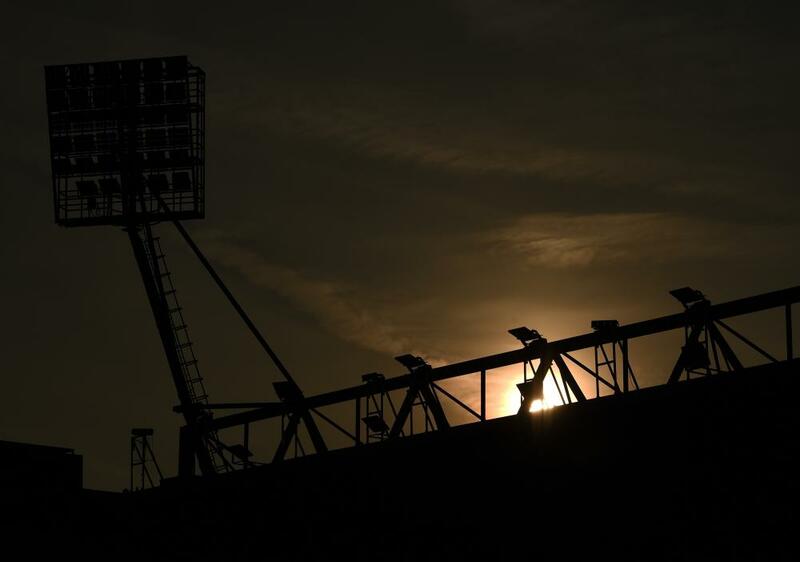 That’s great, tonight, to win three points and to go home with this victory. We knew that it would be a tough game, and I think everybody knows what’s the target for us this season, to get in the top four, and we knew that this game is really important to stay in the competition for the top four. [For the goal] I was confident I could get there. It was a long time I wanted to score a goal like this, and today it came true. It was a good goal. For me, I like it. Watford were the better team for most of the game, I think. There just weren’t quite enough people in it. 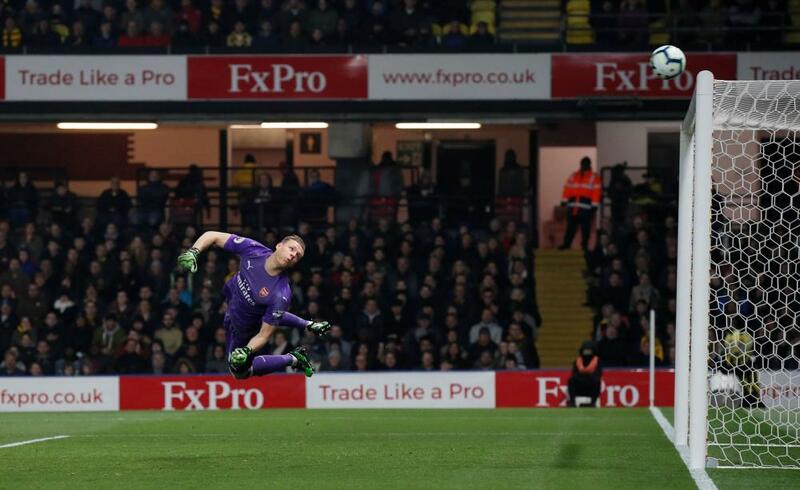 "The best team lost"@Chris_Sutton73 on #Arsenal's "lacklustre" display in victory at Vicarage Road. 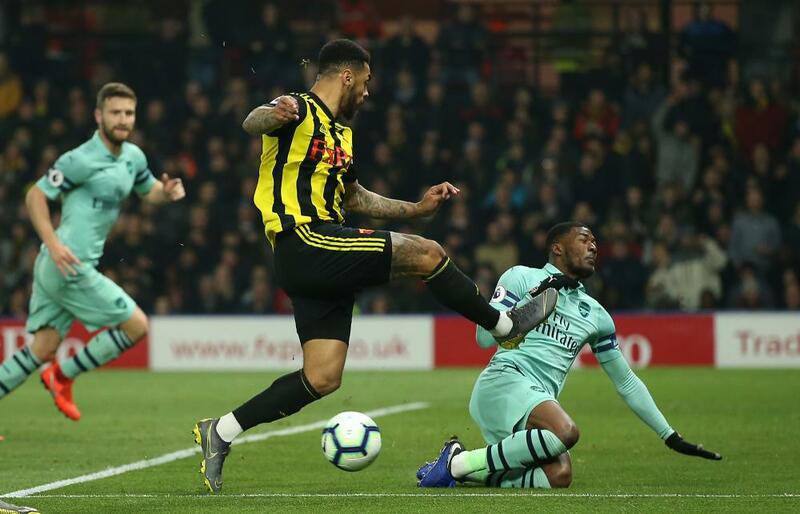 That was as encouraging as an idiotically-given-away defeat can be for Watford, and as unimpressive as a desperately-needed-away-win gets for Arsenal. It was a compelling game, but none of the actual, in-game action really had much impact on the result, which was decided by two very poor mistakes from players who should know better. 90+4 mins: There’s time for one more Aubameyang offside sprint before the referee blows his whistle, and Arsenal have a rare away win! 90+3 mins: ... but in the end the ball loops to Leno, and time is nearly up for Watford. 90+3 mins: Most of Watford’s nine outfield players are in the penalty area, as Janmaat prepares for a throw. 90+1 mins: Watford very nearly find a way through, but the ball doesn’t fall to Gray, or Capoue, or Hughes, and when it finally rolls to Success his attempted pass, or perhaps shot, is miserably weak. 90+1 mins: There’ll be about three minutes of stoppage time. 90 mins: A late three-on-two break from Arsenal is snuffed out by a combination of Capoue and Cathcart. 88 mins: Arsenal keep the ball for a while, working it down the right and then across to the left. 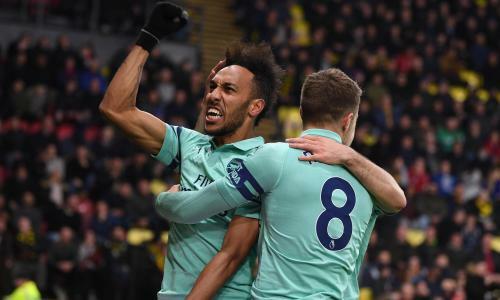 It ends with a good chance for Aubameyang, who bursts onto the ball on the edge of the area, runs into the box and then blasts wide with his left foot! 86 mins: The night’s final substitution sees Ken Sema come on, replacing Masina. 85 mins: Despite those Watford chances, there has been a significant drop in intensity in the last 10 minutes. 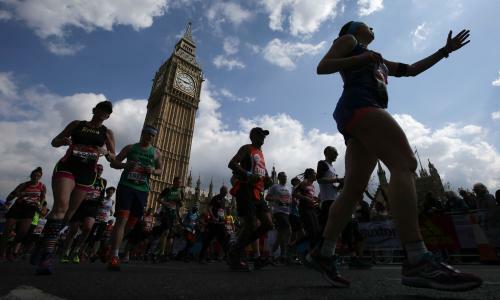 Watford are still pushing, but their belief, and their energy, is running out. 83 mins: And another! Janmaat crosses from the right and Hughes beats Mkhitaryan to the header, but the ball loops over the bar. 80 mins: Chance for Watford! Success nods the ball on and Gray bursts past Maitland-Niles, goes past Leno and tries to turn it into the net, but Maitland-Niles gets back to put himself in the way! 75 mins: Great chance for Arsenal! It’s another fizzing centre from Mkhitaryan, and Aubameyang meets it at the near post, but he pokes the ball over the bar! 74 mins: The quality of Watford’s crossing has been very poor. Twice Success, who doesn’t even have the excuse of tiredness, has given the ball away with rubbish passes infield, and now Gray crosses to nobody. 70 mins: Watford push forward, but Hughes’s volleyed cross is cut out. Arsenal push forward, but Iwobi’s low cross is cut out. 68 mins: Mkhitaryan fizzes the ball across goal towards Ozil, but the German doesn’t seem particularly keen on sprinting so doesn’t reach the cross. Arsenal bring on Maitland-Niles, and take off Ramsey. 67 mins: Watford have come into the game again after a difficult start to the half, but they are starting to take serious risks in defence as they seek an equaliser. I’d be surprised if there wasn’t another goal in this game. 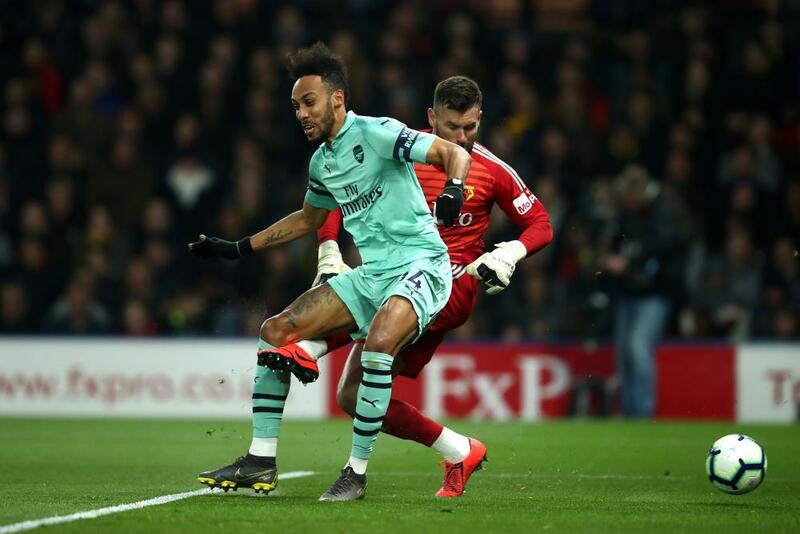 65 mins: Aubameyang is played in, but he was standing just inside Watford’s half and is thus offside. 64 mins: Janmaat finds Gray in the area, but the striker can’t bring the ball under control and it runs off the pitch! What a great chance that nearly was and probably should have been. 62 mins: Watford hit the bar! Doucoure lays the ball off to Masina, who from at least 30 yards smashes a shot that Leno gets nowhere near, and crashes against the angle of post and bar! 61 mins: Another Mkhitaryan shot, this from just outside the area. It’s absolutely wild, high and wide. 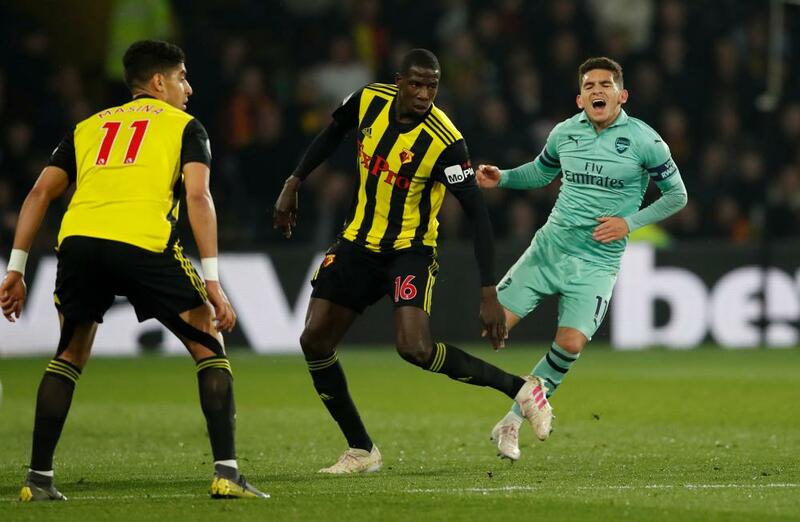 60 mins: Kabasele leaves the field for a couple of minutes to change his boots, and for a while Ozil and Aubameyang are both waiting for any kind of through-ball, with only Cathcart anywhere near either of them. Arsenal can’t quite find a way through Watford’s nine men. 59 mins: And Watford bring Isaac Success on for Kiko Femenia. 59 mins: Arsenal make their second change, bringing Guendouzi on for Mavropanos. 58 mins: Another chance for the away team. Mkhitaryan plays a one-two with Ozil and then spears a shot well wide from just inside the area. 57 mins: What a chance for Arsenal! They break, and have four forwards to Watford’s three defenders. Iwobi crosses to Mkhitaryan, who looked to be about to tap in a volley from six yards, but Foster comes out quickly and gets a leg in the way! 56 mins: Janmaat carries the ball across the edge of Arsenal’s area, and then shoots into Gray’s legs. 54 mins: Capoue gets booked, for going into a challenge on Mkhitaryan with a high foot. The Arsenal player really did make a big show of very limited contact, though. 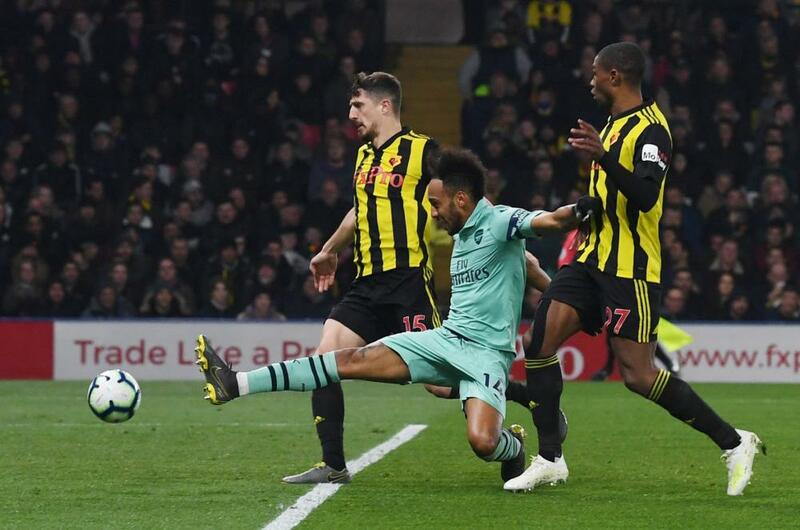 53 mins: Iwobi curls the ball in from the left-hand corner of the area, but Aubameyang just fails to get a boot to it at the near post, and then it curls only just past the far post. 51 mins: Iwobi tricks his way past Doucoure on the byline, but in doing so tricks his way off the pitch. 49 mins: Arsenal have dominated the early moments of this half. Indeed, Watford have barely got a kick. 46 mins: Peeeeep! And they’re off! The players are back out, with Arsenal replacing Torreira with Ozil for the second half. “There’s no way that was a straight red but that needed to happen to Deeney so as to reset the karmic balance,” says Jerome Bishop. 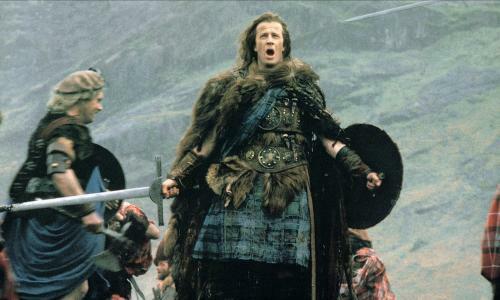 Some clarification from Rick McGahey: “I think you are joking about a ‘reasonably gentle forearm smash’ (although you can never tell with English football fans and their tolerance for physical play), but just to be pedantic (it is The Guardian after all), here’s what Fifa means by ‘excessive force’: ‘Using excessive force means that the player has far exceeded the necessary use of force and is in danger of injuring his opponent.’ Since hitting Torriera in the head wasn’t necessary at all (never could be), red card is just fine by Fifa standards.” Yeah, I get that. But I think Fifa have worked some unnecessary grey area into their wording here. 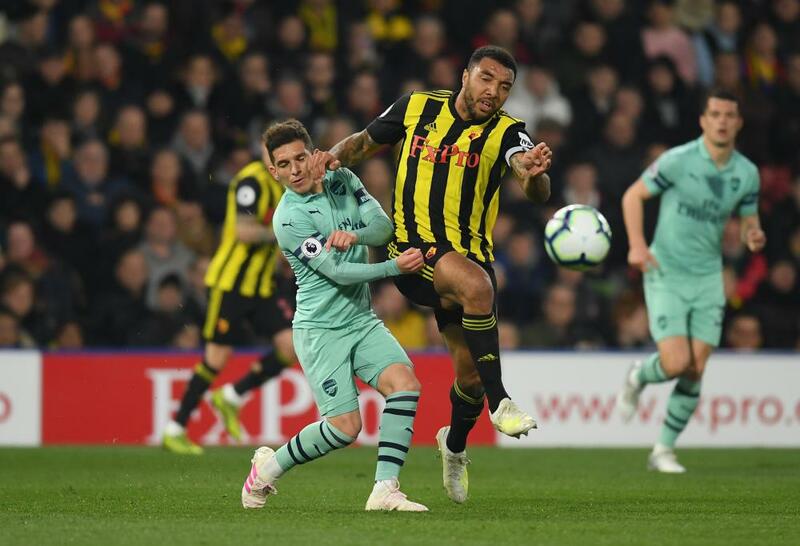 It looked to me like a red card, because Deeney jabbed his forearm into Torreira’s head, but he was not in danger of injuring his opponent, so perhaps I’m wrong. 1 min: Peeeeep! Watford get the game started! The players have gathered in the tunnel.